Vacations for busy people need to be hassle free. I’ve traveled around the world twice. Both times were enjoyable, but not without hassles. To plan those trips, I had to fill out piles of paperwork to apply for multiple visitor visas. I also had meticulously organize the trip logistic and make sure documents were in the right places. After traveling to over 50 countries, including many Caribbean islands, I have come to the conclusion that Puerto Rico is the easiest island destination for Americans. No passport is required when you visit Puerto Rico. Just bring a government issued ID like your driver’s license. That’s it! Prior to visiting Puerto Rico I had no idea what to expect. I thought I would need to bring my passport and didn’t know that Puerto Ricans are American citizens. It turns out, I’m not the only one. Even Delta made that mistake: a Delta passenger and her family were told that passports are required to travel to Puerto Rico – which is completely false. Another thing I didn’t realize until landing in Puerto Rico was just how good the coffee was. Puerto Rico produces some of the best coffee I’ve ever tasted! In fact, at one point in the island’s history, Puerto Rico was the world’s seventh largest producer of coffee. San Juan, Puerto Rico’s capital is just two hours 34 minutes from Miami, three hours 42 minutes from New York, three hours 35 minutes from Atlanta, four hours 36 minutes from Chicago and four hours 47 minutes from Dallas. Those are just a few of the cities in the U.S. that offer direct flights to San Juan. There are three major airports in Puerto Rico. The biggest is Luis Munoz Marin International Airport in San Juan (SJU). The other two are Rafael Hernandez Airport in Aguadilla (BQN) and Mercedita Airport in Ponce (PSE). The island is only 30 miles long from north to south and 90 miles wide from east to west. Many Caribbean cruises start and end in Puerto Rico. San Juan, the island capital is a major cruise port in the Caribbean for cruise lines like Carnival, Royal Caribbean, Norwegian and Celebrity Cruises. It’s easiest to combine a tour of Puerto Rico before or after your cruise vacation. Although the island is a part of the United States, they use kilometers instead of miles. Delta, American, JetBlue, Spirit, Southwest, United and Sun Country are some American carriers that fly into Puerto Rico. Other carriers include Air Canada, Iberia, Avianca, Copa and Condor. Luis Munoz Marin International Airport in San Juan is the busiest airport in the Caribbean. It is an important hub for connecting flights to other islands in the Caribbean. According to SeePuertoRico.com, there are over 588 non-stop flights from the United States to Puerto Rico every week. Added to that, there are 30 flights from the airport to other Caribbean islands and 28 to Central and South America every week. I flew with Delta from New York JFK airport to Luis Munoz Marin Airport using my Delta mileage points. I ended up paying only the $11.20 fee and using 30,000 Delta points for the round trip ticket. It was the lowest amount of points needed for a free flight that I had ever seen. Please be aware that miles redemption is different for every flight. I’ve seen round trip tickets to San Juan cost 75,000 miles, so the prices vary. I received 60,000 bonus Delta miles after signing up for Delta’s American Express credit card and spending $3,000 in the first three months. I was already a Delta Sky Miles member before applying for the credit card. If you want to get free plane tickets, you might want to check into it. My husband, who is a Delta Sky Miles member, also applied for an American Express card with Delta and used the same card to get his free ticket to Puerto Rico. The Chase Sapphire Preferred is another credit card that may help you get enough miles for a round trip ticket to Puerto Rico. They offer 50,000 bonus points after you spend $4,000 in the first three months. Note: These cards charge a fee after the first year. Also, bonuses can change without notice. Check with the official websites for details. If you are not using mileage points to purchase your ticket, I suggest signing up with Airfarewatchdog.com and Skyscanner.net for fare alerts. You can either pre-arrange your transportation from the airport to hotel or get a taxi at the airport when you arrive in Puerto Rico. To save time, I reserved my private transfer from airport to the hotel with Bespoke Lifestyle Management Tour Company. It cost $50 each way for my husband and I to get from the airport to our hotel in Old San Juan. Our driver Lynette spoke perfect English and she came with in a Lincoln Navigator – a full sized luxury SUV. For shared rides or private transfers also check out Puerto Rico Shuttle. I’ve called them and they were courteous and available to answer any questions I had. Taxis charge by the zones you are traveling to. Their rates start at $10 to Zone 2 (Isla Verde), $15 to Zone 3 (Condado, Ocean Park and New San Juan Beaches) and up to $19 to Zone 4 (Old San Juan). 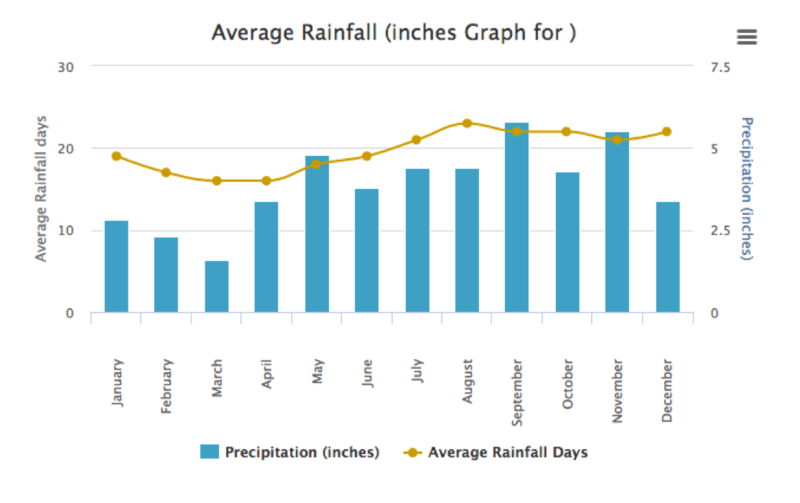 Get the detailed rates from SeePuertoRico.com, Puerto Rico’s official website. Our flight left JFK Airport in New York at 8:10 a.m. and arrived in San Juan at 12:03 p.m. We traveled carry-on only, which meant we could get out of the airport by 12:30 p.m. – no need to wait at the baggage claim. We also didn’t have to go through customs or passport control points since we are Americans, which meant no passport required. Our pre-arranged transfer car was a little late. Lynette from Bespoke Lifestyle Management Tour Company was no where to be found when we were at the transportation waiting area. She arrived late because she expected us to be slower than we were to get out of the airport, possibly held up at the baggage claim area. By 1:15 p.m. we checked into our room at Hotel El Convento in Old San Juan. It took us 20 minutes to get from the airport to the hotel. I planned to explore Old San Juan at 2 p.m., so I had ample time to drop off my bags at the hotel, freshen up and start exploring. I reserved a room for two nights at the Hotel El Convento through Booking.com one and a half months before my trip. Hotel El Convento was my top choice because of its location and history. If I were to go back to Puerto Rico, the hotel would still be my first choice. You can read more about the history of the hotel in Chapter 7. Hotel El Convento has five floors. The lobby, fitness center, a few rooms, Patio del Nispero Restaurant, Salon Campeche meeting room, and other meeting rooms are located on the first floor. The rest of the rooms are located on the second, third, fourth and fifth floors. El Picotea Bar de Tapas and Pizza E. Birra restaurants are located on the second floor. On the third floor is the La Veranda Terrace where breakfast and a complimentary wine reception is held every evening at 6 p.m. for all guests. The hotel offers free coffee and tea there is well. The Plunge Pool and Sun Deck is on the fourth floor. It is a great place for relaxing in the sun with views of San Juan Bay. My room was located on the fifth floor with views of San Juan Bay. I would recommend rooms on the fifth floor with views of the Bay if you don’t mind paying a little extra. Hotel El Convento is walking distance from all the major attractions, restaurants, coffee shops and shopping in Old San Juan. The San Juan Cathedral is located next to the hotel. It is important to find a hotel that is conveniently located in Old San Juan if you want to explore historic sites and dining in Old San Juan. It will save you time and money on transportation. You can’t go wrong with a food walking tour with Flavors of San Juan. The tour included coffee, snacks, small main courses, a cocktail drink and a dessert, in that order. In 3 hours we made six food stops to savor Puerto Rican specialties. We were given coupons for restaurants, bars and shops. One coupon was for 2-for-1 mojitos at Vaca Brava Restaurant. Another coupon was for El Galpon shop for one free local cigar with a purchase of Panama hat. The tour combines history and food. We learned so much about Old San Juan’s history from the tour guide. We booked the tour prior to our trip to Puerto Rico. You can do so to at the Flavors of Old San Juan website. You have the choice of either 10 a.m. or 3 p.m. tours. We chose the 3 p.m. tour. It gave us enough time to check in at Hotel El Convento, and walk to the meeting point by 2:45 p.m. to meet with the rest of the group. The tour costs $79.99 per adult (age 10 and above) and $69.99 per child (ages 4 to 9). At Aromas Coffee House, a bakery and coffee shop, we tried two Puerto Rican specialties: mallorca and café con leche. Mallorcas are sweet, fluffy buns sold all over Puerto Rico. They are sliced in half, buttered and flattened in a griddle, commonly used as the buns for grilled ham and cheese sandwiches. Before serving, confectioners’ sugar is sprinkled over the top of the mallorca, creating a sweet and savory sandwich that is unique to Puerto Rico. Mallorca was named after Mallorca, one of the Spanish Balearic islands in the Mediterranean Sea. According to TastyKitchen.com, it originates from Mallorca’s ensaimades bread. You can make your own pan de Mallorca using Tasty Kitchen’s recipe. In my travels to over 50 countries, I’ve come to the conclusion that Puerto Rico has some of the best coffee in the world. When I tasted my first café con leche at Aromas Coffee House, I knew I was in for a treat. I had planned a private guided tour to two coffee plantations on the second day of my trip (you can read about it in Chapter 4). Aromas’ café con leche without sugar had a hint of sweetness. It was smooth and aromatic. They use Arabica coffee from Adjuntas, one of the coffee regions of Cordillera Central in Puerto Rico. The second stop in the food walking tour was Señor Paleta, where we had popsicles. These weren’t just any generic Nestlé popsicles, though. Señor Paleta has popsicles in various flavors, and you can choose from either milk or fruit-based ones. The line can be long when cruisers drop by in the afternoon. There are no seats inside the store, but across the street are shaded benches with views of the bay. 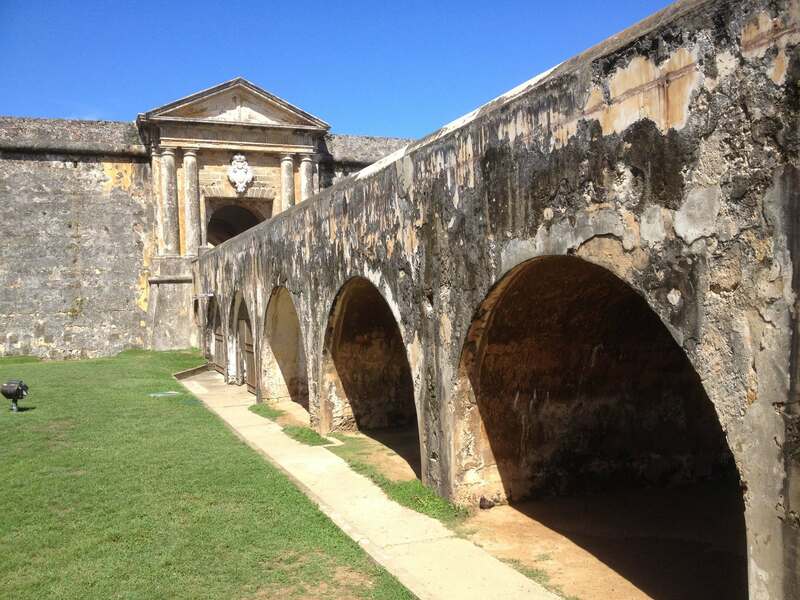 It is the Bastion de las Palmas de San Jose, a scenic lookout point and part of the defensive walls of Old San Juan. Popsicles are a great treat when walking in sunny Old San Juan. While we stood at the Bastion de las Palmas de San Jose with our popsicles, a Royal Caribbean cruise ship was cruising towards the Bay with a boat load of cruisers. San Juan is laid back. The walking tour gave us plenty of time to enjoy the sceneries and old buildings. Our tour guide even gave us history lessons and pointed out some interesting sites like the narrowest apartment in Puerto Rico. Look at the photo below of four places we passed by on our way to the next stop. On the top left is the narrowest apartment (Casa Estrecha) at 101 Tetuan Street (building with yellow door frame). It’s only five feet wide. On the top right is the Capilla del Santo Cristo (Chapel of Christ the Savior) built from 1753 to 1780 on top of the city walls. In front of the chapel were hundreds of pigeons, as a local came with bird food to feed the pigeons. The bottom left shows one of the many narrow cobblestone streets in Old San Juan and the bottom right shows Calle de la Fortaleza, Old San Juan’s main shopping street. Our food tour essentially doubled as a tour of Old San Juan while we walked with our tour guide from place to place. Note: Most of the old blue-ish cobblestones from the 1700s are deteriorating and being replaced with new cobblestones. The old cobblestones known as adoquines were from were from Spain and cast in iron furnace slag. The third stop was a snack stop. Here we were introduced to two popular Puerto Rican snacks/appetizers: ceviche and alcapurria. Alcapurrias are fried taro and green banana fritters stuffed with meat. They tasted best when dipped in Puerto Rican hot sauce – pique. Ceviche needs no introduction. It is a Latin American dish of marinated raw seafood made popular by Peruvian chefs. The fourth stop was where we rolled up our sleeves and tried our hands at making mofongo, the main dish of the day. We weren’t able to see the whole process of making mofongo, but we did a small part of the preparation, mashing the already seasoned and fried plantain in a pilon. A pilon is a Puerto Rican wooden mortar and pestle. The Taino Indians used it for grinding herbs, medicine, and fruits. Today, it is a popular Puerto Rican souvenir and an important tool for making mofongo. Meats like chicken, or fish is added along with a creole sauce (sofrito). Rice and beans are usually served on the side. Mofongo was created by the African plantation workers and was considered poor man’s food. These days, it is no longer so. Mofongo is Puerto Rico’s national dish. Chefs around the island compete to create the best mofongo. At Rosa de Triana, the wait staff offered sangria (extra charge) with the mofongo. Each tour member was given the pilon and a portion of the fried plantains. We mashed the fried plantains and ate it with rice, salad and beans. Rosa de Triana serves Spanish food like paella and tapas. It is located directly across the street from Hotel El Convento. The restaurant has an intimate atmosphere and part of the space was once a jail cell. Rosa de Triana was our fifth stop. It has a courtyard dining area and is the go-to place for pina colada. To get to the courtyard dining area, we entered through a large door made of ausubo, hardwood common in the Caribbean, on Del Cristo Street, one of the oldest and loveliest streets in Old San Juan. Here we were served pina colada, made with Puerto Rican rum – Barrilito local rum, not sold anywhere else. Barrilito is Puerto Rico’s oldest rum producing company. It is aged eight to 10 years in recycled whiskey bottles from Tennessee. Each bottle of rum costs $21. When in Puerto Rico you must try their pina colada. If you don’t drink alcohol, ask for the virgin pina colada. The food walking tour was not complete without a stop for dessert. So we headed to our final stop after the pina colada for cheese flan (flan de queso). By then we were completely full and couldn’t eat much more. Getting from Rosa de Triana to our next stop was the longest walk in oue fun-filled three-hour food walking tour. We passed by the famous Four Seasons Fountain and Tite Curet Alonso’s bronze statue on his favorite bench at Plaza de Armas. Tite Curet Alonso was Puerto Rico’s famous salsa song composer who died in 2003. Our tour guide, Carmen, pointed out the significance of the Four Seasons statues and told stories about Puerto Rico’s salsa king – Tite Curet Alonso. It was getting dark by the time we arrived at Vaca Brava. A bull statue adorned the front door of Vaca Brava and inside you’ll see a big wooden pilon. Our guide stated it is a great restaurant for meat, and of course the flan. Puerto Rican cheesecake flan is a traditional dessert in the island. The three hour tour ended at around 6:15 p.m. We had enough time to take a walk from Vaca Brava to Paseo de la Princess to view the sunset. Paseo de la Princesa is a popular pedestrian-only walkway in Old San Juan. We walked from Plaza Darcenas (near the cruise ship docking area), towards the Puerto Rico Tourism office to Raices Fountain. Raices Fountain was worth a stop as the sculptures designed by Spanish sculptor Luis Sanguino show Puerto Rico’s cultural diversity. We then walked towards the fortified walls towards San Juan Gate (Puerta de San Juan) – one of the remaining old gates of Old San Juan. This path along the coast is known as Paseo El Morro and will take you to El Morro Fort. During my visit the path after San Juan Gate was closed, so I didn’t get to walk to El Morro Fort. The walkway is the best place to watch the sunset in Old San Juan. From the San Juan Gate, it was a less than five minutes walk uphill to Hotel El Convento and San Juan Cathedral. This gate was built in the 1600s to direct sailors and voyagers to go straight to San Juan Cathedral. According to our food walking tour guide, Carmen, the sailors were meant to go to the cathedral before anything else to thank God for the safe voyage. Within five minutes, we were at our hotel, Hotel El Convento, and had enough time to grab our complimentary glasses a wine on the third floor before they took them all away. The cheese and fruits were gone by 7:30 p.m. The complimentary wine and cheese hour was from 6:00 p.m. to 7 p.m.
Visit viator.com to book this food tour. It was an early start on the second day. At 6 a.m., while it was still dark outside, the driver from Bespoke met us at Hotel El Convento. 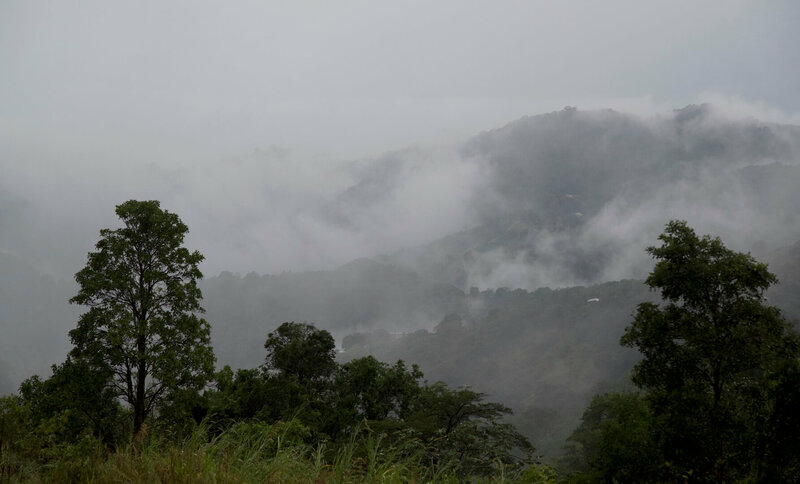 It had rained overnight and the rain continued as we headed out to the mountains via Ruta Panaromica, Puerto Rico’s scenic mountainous route. The private tour included visiting two coffee farms in the mountains. 30 minutes after leaving San Juan, we were on La Ruta Panoramica, which directly translates to English as “the scenic route”. The trouble began when Felix realized both his smartphone and the company’s iPhone were both not receiving signal in the mountains. We were lost on a misty road surrounded by thick forests. Occasionally we passed by abandoned homes and burnt-out cars, which ostensibly were involved in accidents. Felix was visibly nervous as he didn’t know where he was going. It was 7 a.m. and we were the only vehicle on the road. After asking around and making a few U-turns, we made it back on track. The two-hour journey became a three and half hour journey from Old San Juan to Jayuya – distance of just over 60 miles. If you’ve snaked through single lane roads in the ridges of Central Cordillera, you will have noticed the lack of signage. Getting lost is easy and having a GPS is often not enough. You need experience, a paper road map and the help of a jibaro (mountain-dweller). Looking back, I think it was an amazing experience to be lost in the mountains. Otherwise we would not have seen what we saw – winding roads could only allow one vehicle, both ways at one time. And low lying trees that touched the roof of the small vehicle. Note: In spite of us getting lost, our driver Felix was professional, kind and courteous throughout the trip. We highly recommend him and his services. Felix was an efficient and careful driver. We also appreciated his honesty, telling us the truth right from the beginning that he had never been to Jayuga with tourists. We were fortunate to have him. There aren’t many tours that take tourists to Jayuga. Bespoke Tour Company may be one of the few tour and transportation companies that offer trips to Jayuga. Traveling along the Ruta Panaromica may not be ideal if you only have 72 hours in Puerto Rico. But for those who love the mountains, wildlife, trees, villages, views, cloud forests and coffee, I would suggest hiring a driver. The entire route is 167 miles long, but you can take just part of the route. Our itinerary included traveling from San Juan to Jayuya to visit Hacienda San Pedro, and Barrio Anon (at the foot of the highest mountain, Cerro Punta) to visit Hacienda Pomarrosa and to Ponce. Even if you’re not visiting coffee farms I would suggest you take a day or two to explore Puerto Rico’s mountains if you have at least five days in the island. The peacefulness, the greenery and breathtaking mountain views are worth the trip. Hacienda San Pedro is located near the town of Jayuya, in the central region of Puerto Rico about 2,000 feet above sea level. The coffee farm was started by Roberto’s grandfather, Emeterio Atienza, at the end of the 19th century after working over 30 years for coffee plantations in the region. Emeterio immigrated to Puerto Rico from Spain at the age of 13. Arriving with just a suitcase, the young Emeterio worked hard and dreamt of the day when he could plant coffee in his own land. That dream came true in 1931 when he started Hacienda San Pedro. His son Alberto who is now in his 90s has since given the reins to his son, Roberto, a third generation coffee grower who has worked in the farm for over 40 years. Under Roberto’s leadership, Hacienda San Pedro has grown into a 216-acre coffee and fruit farm. Roberto’s son and daughters have continued the tradition by venturing into selling specialty coffee in their own coffee shop in the Santurce area of San Juan. Their specialty and commercial grade coffee are also sold throughout Puerto Rico and United States. A tour of the farm includes visiting the coffee plantation, seeing the process of harvesting the cherries (from October to January only), and viewing the plant’s processing machines, drying machines, milling machines and roasting machine. All visitors have a chance to taste the specialty coffee from Hacienda San Pedro and purchase a bag or two of coffee beans from the coffee shop. To preserve the history of Hacienda San Pedro, the Atienzas have maintained a small on-site museum with vintage burr grinders, photos and memorabilia from years past. Hacienda Pomarrosa is 3,000 feet above sea level in Barrio Anon, about 45 minutes from Ponce, the second largest city in Puerto Rico. The coffee farm is 40 minutes from the Jayuya by car. The easiest way to get to Hacienda Pomarrosa from San Juan is through Highway PR-52. Because of its proximity to the highway, Hacienda Pomarrosa is easy for vacationers renting cars to get to. Kurt Legner is the owner and an immigrant from Germany. He runs the eight-acre coffee farm with his son, Sebastian. A tour experience in Hacienda Pomarrosa is entirely different from Hacienda San Pedro. Kurt runs his coffee farm as a mountain resort. He built three casitas (villas) in his eight-acre property and started welcoming guests to his casitas in 2008. Each guest staying in a casita is served a full breakfast prepared by Sebastian. A typical breakfast includes fresh seasonal fruits, freshly squeezed orange juice from the farm’s orange trees, Pomarrosa’s specialty coffee, avocado toast with eggs and bacon or banana pancakes. Special home cooked dinners are available upon request. Sebastian is a fine cook who works only with seasonal produce from his farm and from the local market. Hacienda Pomarrosa has free-range chicken roaming in the farm, and in recent months Sebastian has started raising rabbits with the intention for food – but he is beginning to have a soft spot for the rabbits. Guests are free to roam the coffee plantation. Kurt planted a few pine trees in the farm to remind him of his homeland in Germany. Cool misty cloud passed through while I walked in Hacienda Pomarrosa giving me a sense of enchantment, something I didn’t expect in the tropical island of Puerto Rico. 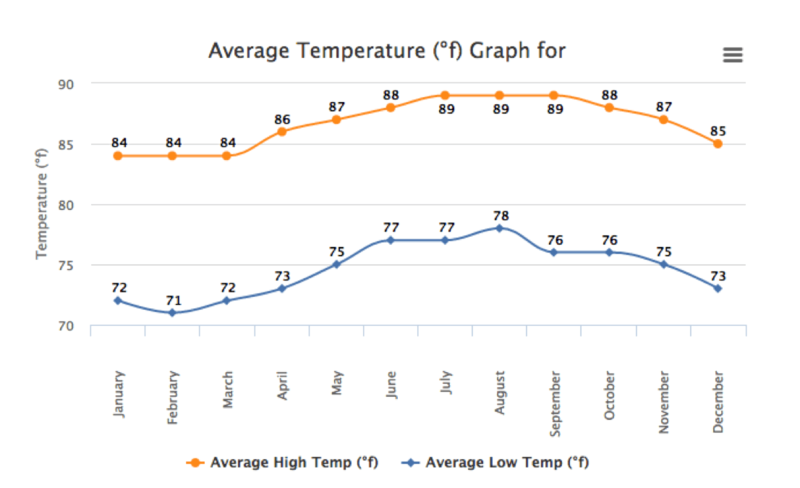 When it rains and during the winter, the temperature at the farm is often 20 degrees below the temperatures in Ponce and San Juan. Hacienda Pomarrosa sits at one of the most strategic points in the ridges of Central Cordillera, close to two Puerto Rican peaks, Cerro Maravilla, and Cerro Punta at 4,500 feet above sea level. On a clear day, you can see the Caribbean Sea and the mountains from the property. It was raining on my visit and the temperature was about 75 degrees Fahrenheit. On the same day it was 90 degrees in Old San Juan. Non-staying guests can join Kurt and Sebastian for their daily coffee tour. At the start of the tour at 11 am, Kurt gathers his guests around his rectangular table in a gazebo complete with coffee machines, coffee cups, plates and cutlery. While he shares stories and the history of coffee, his son Sebastian serves various types of freshly brewed coffee. On the table there is also a plate of freshly baked banana bread. During my visit, Sebastian served his coffee cherry jam – jam made from freshly picked coffee cherry skin. Nothing in this farm goes to waste. Sebastian has found ways to use every bit of the coffee cherries. The coffee tour includes a walk through the farm, the processing room, drying room, roasting and packaging room. Guests were given an opportunity to buy Hacienda Pomarrosa’s half-pound fresh coffee at $17 each. Specialty coffee doesn’t come cheap in Puerto Rico. As we drove away, Felix the driver asked how much I paid for my bags of whole bean coffee from Hacienda San Pedro and Hacienda Pomarrosa. When I told him the prices he said he would stick to his El Coqui coffee, a mainstream brand which is less than half the price. These directions were provided by Hacienda Pomarrosa. If you’re coming from Ruta Panaromica from Jayuya, road #143, stay on 143 for 7.7 miles, turn right to road #511 and after 0.3 miles turn left to the entrance of the Hacienda. After the coffee plantation tours, we headed to Ponce, the second largest city in Puerto Rico. Our time was limited. Ponce is known for its world-class museums like Ponce Museum of Art, Ponce History Museum, Music Museum, and Architecture Museum. 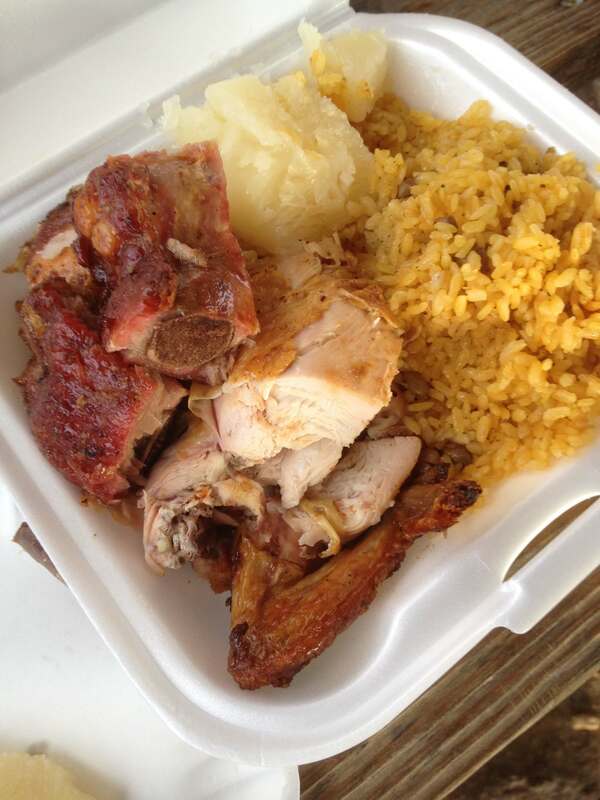 Our plan was to have a late lunch in one of the restaurants in Ponce, but we had a change of plan after Felix informed us of the delicious barbecue chicken and ribs at a roadside food truck. Felix drove towards San Juan and stopped at Viktor Pollo at Santa Isabel, about 30 minutes from Ponce. 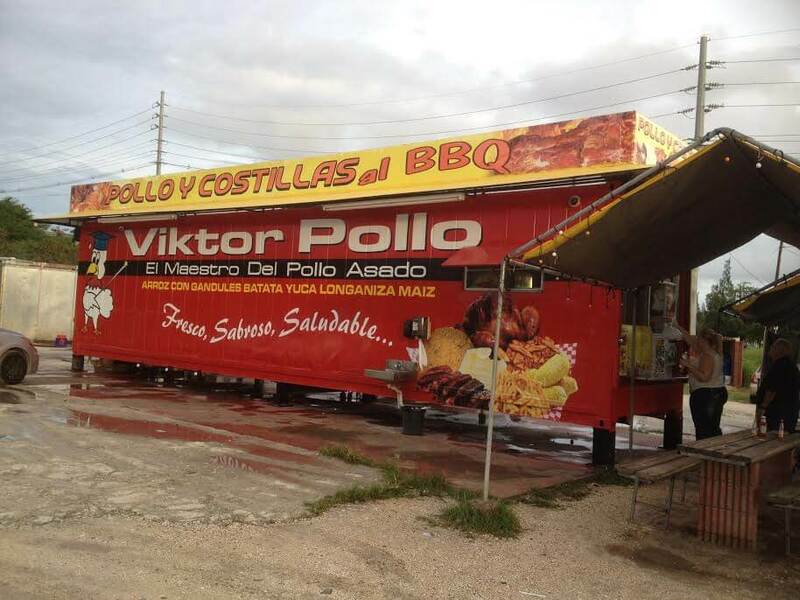 Apparently, Viktor Pollo is famous in Puerto Rico. It has a Facebook page and Yelp reviews. For under $10, my husband and I shared a meal of chicken, ribs, rice and yucca. I loved the yucca, something you ought to try when in Puerto Rico. Yucca is a popular starchy plant in Cuba and other Caribbean islands including Puerto Rico. On the third day, we started at a local bakery/coffee shop, explored Old San Juan by foot, rode on the free trams around old San Juan and to El Morro, ate in more restaurants and checked out a few of the coffee shops in Old San Juan. For advice on where to find the best coffee in Old San Juan, read this article. I didn’t get to go to Santurce, San Juan’s hipster neighborhood where you can find specialty coffee shops. While in Puerto Rico, I wanted eat Mallorca and drink coffee, two of the island’s specialties. Our hotel concierge recommended Cafeteria Mallorca. Cafeteria Mallorca is the ultimate place for a simple cup of strong black coffee and authentic mallorca for breakfast in Old San Juan. This old-school diner is where the locals hang out in the morning. Cafeteria Mallorca takes only cash – no credit cards. This place is usually crowded which is a good sign – good food! Cafeteria Mallorca is located at 300 San Francisco, Old San Juan. 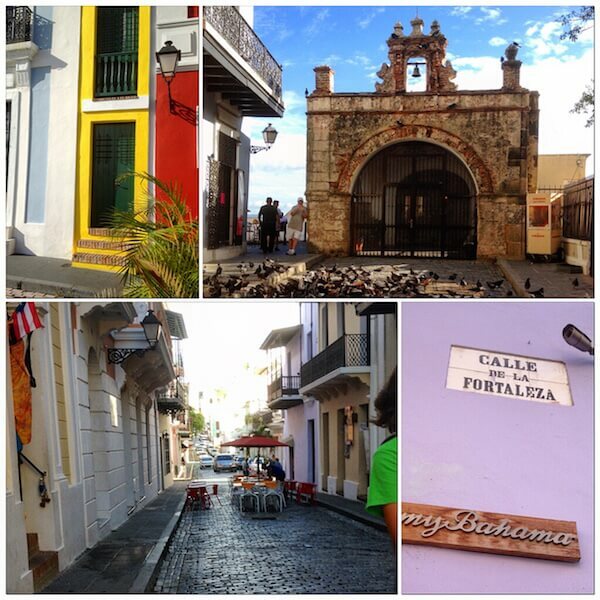 Staying at Hotel El Convento gave us the benefit of being able to easily explore Old San Juan by foot. The historic hotel is just in front of Cathedral of San Juan, and a one minute walk from the old gate. All the popular restaurants, bars and shops are between two to 20 minutes’ walk from the hotel. The city also provides free trolley services around Old San Juan and to the El Morro. 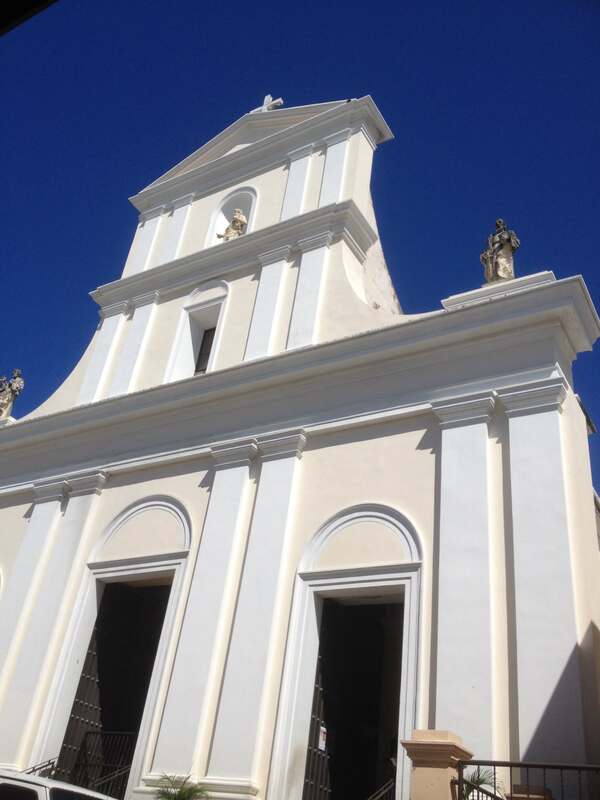 Cathedral of San Juan (Catedral de San Juan Bautista) was constructed in 1521 and is one of San Juan’s oldest buildings. The original structure was destroyed by a hurricane and the current building was restored in 1917. It is the resting place of Ponce de Leon. El Morro or Castillo de San Felipe del Morro is a 6-level fort built to protect San Juan Harbor, which was an important harbor for Spain since the late 1400s. It started as a small fort but as San Juan’s position grew in importance to the Spanish, the fort evolved as well. The fort protected Spain’s access to the New World’s wealth for most of 300 years. You can ride the free tram from the cruise ship piers to El Morro. The yellow tram stops at El Morro. Check with the tourism office or your hotel for updated route options. El Morro is a San Juan National Historic Site and is operated by the National Park Service (NPS). Hotel El Convento’s staff recommended Café Puerto Rico for mofongo, and so we had seafood mofongo there. Vegetable mofongo and chicken mofongo cost $12 each, whereas shrimp mofongo was $19 and my seafood mofongo cost $24. Mofongo is a must-have when in Puerto Rico. It is a typical Puerto Rican dish of fried plantains mashed with garlic, oil and salt filled with your choice of meat, fish, shrimp or vegetables. Café Puerto Rico was packed and we waited for over 20 minutes to get a table outside. You can choose to dine either inside or outside. Our third night’s stay was at the Condado Vanderbilt Hotel, a beach hotel in Condado. I had reserved our room for one night directly with the hotel, one and a half months before my trip. While it might seem strange to stay in two different hotels in a 72 hour trip, I did so to experience two sides of Puerto Rico. My two nights in old San Juan (at Hotel El Convento) allowed me to be close to all the historic sites and restaurants. My one night at a beach resort (Condado Vanderbilt Hotel) gave me a feel of San Juan’s beaches and a chance to eat at the 1919 Restaurant. Condado Vanderbilt Hotel surpassed our expectations. Established in 1919, it combines old with the new, where guests can choose either the Heritage Guestrooms (in the old wing) or the Tower Guestrooms (in the new tower). For fine dining, we chose 1919 Restaurant at the Condado Vanderbilt Hotel. Michelin-star Chef Juan Jose Cuevas believes in the locavore movement – using ingredients sourced from local farmers in a farm-to-table concept. The waiters were attentive to details, and the atmosphere was laid-back. We felt we were welcomed to sit for hours if we wanted to. After a meal at the 1919 Restaurant, we sat at VC Lounge (next to it) and enjoyed live music and cocktails. The restaurant was named “1919” because the Condado Hotel was established by F.W. Vanderbilt in 1919 as a luxurious tropical retreat. Reservations are recommended. The restaurant is closed on Sunday and Monday. We decided to have breakfast at Pinky’s, a small sandwich shop along Ashford Avenue, the main thoroughfare of Condado Beach to get a feel of the area and to eat more Mallorca before leaving for home. Pinky’s is a 14-year-old establishment serving coffee and delicious Mallorca – ham and cheese sandwiches with sweet buns. Eating in Pinky’s is cheaper than at the Condado Vanderbilt’s Ola Oceanfront café. Condado Vanderbilt Hotel shares a beach with La Concha Hotel. I probably spent only 15 minutes at that beach. The Condado beach is more suitable for scuba diving, sea kayaking, snorkeling and surfing than for casually dipping in the water. 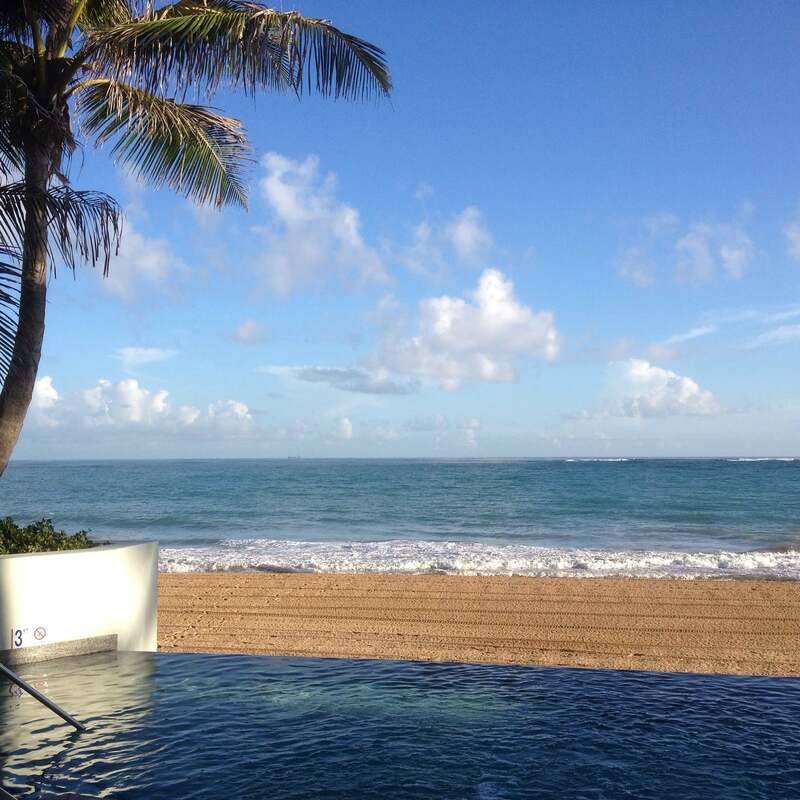 It’s best to spend time at the beautiful infinity pool with an ocean view in Condado Vanderbilt. After some time at the pool side it was time to head out to the airport. We had a pre-arranged transfer with Lynnette from Bespoke Lifestyle Management. Our 72-hour getaway gave us time to visit a few historic sites in Old San Juan, savor Puerto Rican food, check out coffee farms, drink Puerto Rican coffee, and of course some downtime at Condado Vanderbilt Hotel. Choosing the right hotel is crucial. It doesn’t matter whether you’re going for a 72-hour or 7200-hour vacation – when choosing a hotel, to me the most important factors are location, location, location. The area must be safe, walking distance to restaurants and a few major attractions. After location, I consider the reviews and cost. We chose two nights at Hotel El Convento because it is located in the heart of Old San Juan where we could explore the historic sites on foot and check out all the restaurants and shops without having to hire a car, spending time and money on transportation. I’m also a history buff, so staying at the historic El Convento with views of San Juan Harbor fitted well with my Puerto Rico travel plans. We chose to stay a night at Condado Vanderbilt Hotel because of its historic aspects and to be close to the beach. Both hotels exceeded our expectations. Here are some of the pros of staying at Hotel El Convento and Condado Vanderbilt Hotel. 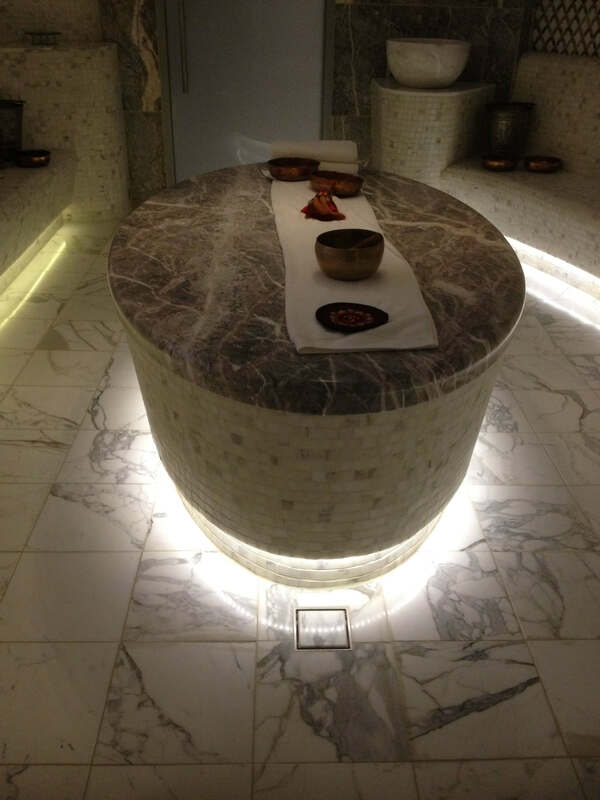 This five-story hotel started out as a Carmelite Convent in 1651. Known as the Monastery of Our Lady Carmen of San Jose, it was the first Carmelite Convent in the Americas. After 252 years of housing nuns, the convent was closed on December 9, 1903 and sold to the church in 1913 for just $151. Most of the buildings were in disrepair and abandoned since then. In 1959, Robert Frederic Woolworth bought the building and converted it into a luxury hotel. The original three-floor convent was transformed into a five-floor hotel with 100 rooms. The hotel’s courtyard has a restaurant (Patio del Nisperio Restaurant) and a 300-year-old nispero fruit tree from Spain. The convent chapel was transformed into a black tie-only dining room called the Ponce de Leon Room. 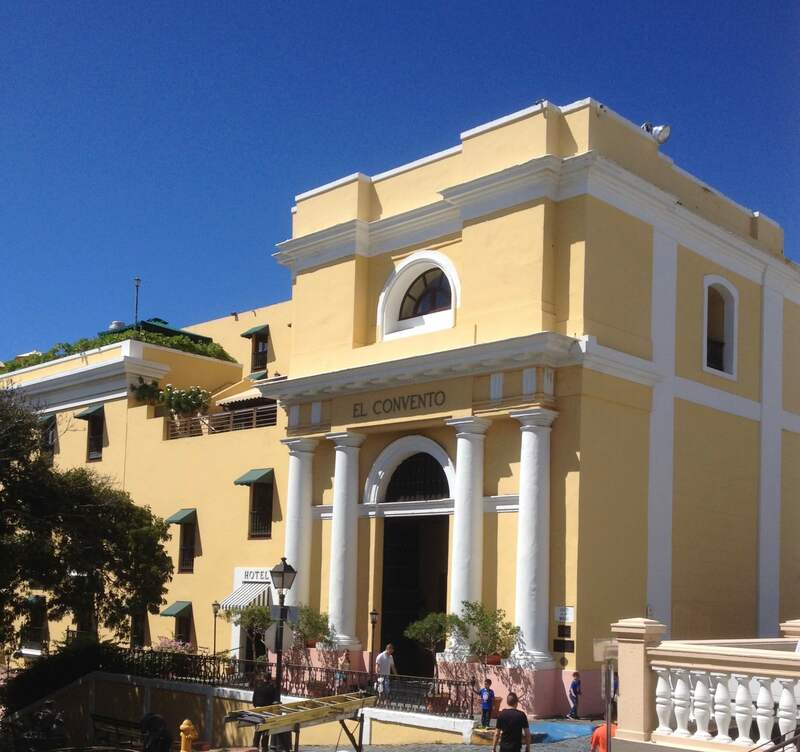 Hotel El Convento is also one of the tourist attractions included in the Old San Juan walking tour. You can book through Booking.com or directly with the hotel. We stayed at room 514 and here is the view from the room. After two nights in the city center, we were ready for the beach resort. I think two nights in Old San Juan was enough for me to discover the historic sites, to walk on the cobblestone streets, and to enjoy the day and evening vibes of the old city. The original Condado Vanderbilt Hotel was designed with an early Spanish Colonial Revival style and is adjacent to the Atlantic Ocean. Frederick William Vanderbilt hired the same architectural firm which designed New York City’s Grand Central Station to design his hotel in 1919. The original structure was beautifully restored and two new 11-story towers were added. I love the hidden spots around the hotel where we can sit on lounge chairs, relax and listen to the crashing waves. The environment was so peaceful and the views from the hidden corners, restaurants and infinity pool were some of the pluses of Condado Vanderbilt Hotel. You can book through Booking.com or with Hotels.com. We stayed in a one-bedroom suite with an ocean view. I highly recommend getting a room with an ocean view when staying at Condado Vanderbilt Hotel.